Home > Safety Signs > Fire Safety Signs > Fire Door Signs > All visitors and drivers must report to reception symbol and text safety sign. 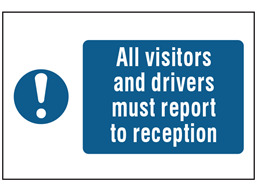 All visitors and drivers must report to reception symbol and text safety sign. Fire exit keep clear sign. Fire exit, running man right, arrow ahead. Fire door keep shut sign. Sound horn symbol and text safety sign. All visitors and drivers must report to reception symbol and text sign. Part of our mandatory safety sign range, to instruct entrants to the premises to make their way to the reception. Access and emergency safety signs. All visitors and drivers must report to reception. Mandatory safety sign, comply with ISO EN 1710 and Safety Signs and Signals Regulations 1996. MS2160 Size 300mm x 200mm. Material self adhesive vinyl. MS2161 Size 300mm x 200mm. Material rigid plastic. MS2162 Size 600mm x 400mm. Material self adhesive vinyl. MS2163 Size 600mm x 400mm. Material rigid plastic.